One of the best trends of the new year is the full wall backsplash in the kitchen. We’re seeing a rise in tile designs, and even more creative alternatives to decorate the walls in an efficient way. There are many benefits to having this full backsplash and we’ll tell you a few of them. The walls are covered in white “metro” tiles framed in black grout, something we don’t see often and which I feel will look clean and new for longer. One of the best benefits of having a full tile backsplash is how easy it is to clean, but also how clean it looks even when you haven’t wiped it down. Painted walls tend to show every dent, scratch or crack, while tile reveals a practically flawless finish that will stand the test of time. You can toss out the leftover paint, wood filler, and magic erasers because all you will need is a damp cloth to make the walls sparkle. Tiles can be exceptionally versatile in a number of design styles. 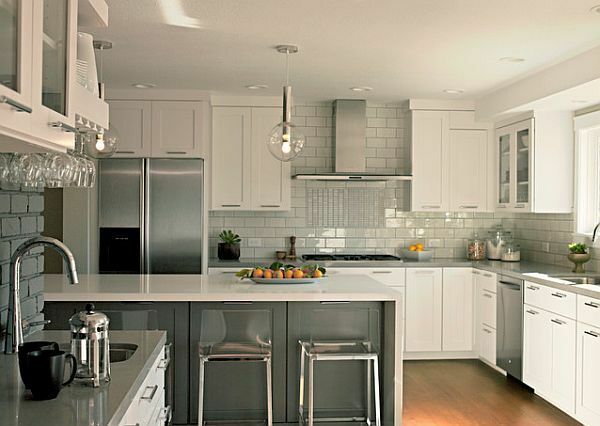 This kitchen in particular has utilized the clean white tiles to pair with their simplistic modern design. The larger tiles help to make this kitchen look taller and more open, and reflect the natural light beautifully. The wall sconces also help to illuminate the space created by the absence of cabinetry. A tip when doing a full backsplash is to take advantage of open shelving. This will maximize the amount of tile you are able to use making your perfect tile choice more impactful. These floating shelves create an opportunity for task lighting to bring more attention to the complimentary countertops and give a spotlight to your backsplash. Open shelving can also bring a relaxing vibe to the space that could otherwise feel closed off or crowded. What kind of tile would you use in your home? As you can see, the possibilities are endless.